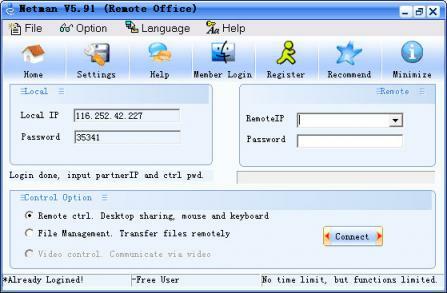 Netman is a user-friendly free remote control software that offers remote computer access, file transfers, audio and video conversations and a number of other useful features. Netman is using the DSE encryption mode (generally used by banks) and allows setting the treble password, therefore ensuring highly secure remote connections. - Screen Sharing: Allows you to see the screen directly, control it via mouse and keyboard, capture it on video or pictures and switch remote control on/off, all of it done with high controlling speed and smooth picture transformation to improve your remote access experience. - File Management: You can transfer files remotely (upload and download), edit the file names, delete them and create new folders. - Video Conversation: Remotely turn on the camera, video chat and record everything that is monitored. - Remote start/shutdown: You can start a computer remotely if you dial the phone next to it using Netman Computer Starter (hardware).